The 80 20 Rule roughly states that 80 percent of outcomes can be attributed to 20 percent of inputs. The basic principle of the rule is that a few (20 percent) of your activities or inputs are vital while many (80 percent) are just trivial to getting your end results. The rule is basically an observation that most things in life are not distributed evenly. The rule has been applied to a number of different facets in both business and life. The 80 20 rule can be used to help identify which factors are most important and should receive the most attention to get the most efficient use of time and energy. In other words, your time and energy should be focused on addressing the factors that have the most effect on your end results. The 80 20 Rule is a helpful concept for time management. The rule can be a very effective tool to help you manage your time more effectively. Time management is about taking control over and prioritizing your time. Your ability to choose between the important tasks and the unimportant ones is key to your success in work and in life. The key to effective time management is to find the 20 percent or so of your efforts that will give you the most value and the greatest returns on your effort. One of Stephen Covey’s Seven Habits of Highly Effective People is “Put first things first.” People who are effective and productive typically start and focus their energy on the most important tasks. The 80 20 Rule is a great reminder for you to focus your time and energy on the 20 percent that matters most. Those actions or tasks will likely produce 80 percent of your results. In 1895, Italian economist Vilfredo Pareto discovered that 80 percent of the wealth in Italy was owned by only 20 percent of the population. After Pareto made his observation, he created a mathematical formula to describe the unequal distribution of wealth in his country and published his findings and formula. In the late 1940s, Dr. Joseph M. Juran began to apply the Pareto principle to quality issues. He unveiled a similar principle he called “the vital few and trivial many.” Juran, who studied Quality Management, identified 20 percent of the defects were causing 80 percent of the problems. Dr. Juran’s “vital few and trivial many” observation shaped the principle that 20 percent of a set is generally responsible for 80 percent of a related results. 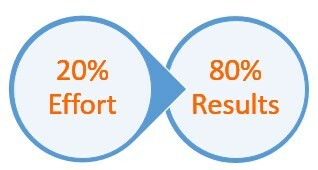 Dr. Juran attributed this 80/20 Rule to Pareto, calling it Pareto’s Principle. The 80 20 Rule means that in any set of things a few (20 percent) are vital and many (80 percent) are considered trivial. 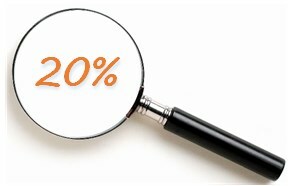 In other words, 80 percent of your outcomes or results come from 20 percent of your inputs or efforts. The key is separating the vital few from the trivial many, and then focusing on the vital. The 80 20 rule is a rough guide about the typical distributions. The numbers are not always exactly 20% and 80%. It is more a rule of thumb. Many times it will be different (e.g. 70/30 or 65/35), but the general rule holds true; few are vital and many are trivial. It does not really matter what numbers you apply, the important thing is to understand the principle: only a few specific activities you do account for the majority of your results. So identify and focus on those few things.